As much as I dislike doing this, I've stayed back in Pune after a day spent in meetings at the edit office and I'm not looking forward to spending the night in our guesthouse by myself. I anticipate the boring evening ahead of me, dinner is going to be a lonely affair and I add it to the list of many more similar evenings. I'm staying away from home to drive the new Audi A6 wondering if its truly going to be the game changer it promises to be. Sirish is trying to figure out how it stacks up against the competition and his drive through the western ghats which I accompanied him on was incredibly stunning in several aspects least of all the scenery. My role is to evaluate the A6 on its own merits and so rather than spend a dull evening by myself, I hit Pune town driving aimlessly looking for a nice meal, a sharp espresso and perhaps some company. Now the A6 isn't an all-new car as much as it is a reinterpretation of what was a fantastically engineered package with several new traits brightening its aura. India is familiar with the A6 and each has grown better than the one before it by considerable amounts of detail, though Audi would certainly wish the car was even more familiar in this market, hoping it would enjoy as much success as the 5 Series or the E-Class does. Now each new A6 while not always a herald of forthcoming technology has always been a showcase for the smoothest integration of all the technology Audi had developed to date. So these new traits we see in the A6 are derived from the recent design and engineering philosophies that is making Audi's range of cars more desirable than ever before. The basic architecture of this car hasn't changed much it still has all the traditional inputs such as the lightweight body, all wheel drivetrain called Quattro and the brilliant range of diesel and petrol engines. What it adds to the car now are visually stirring cosmetic changes, smarter than ever before interiors, a new transmission offering more refinement and better efficiency and adaptive air suspension with drive select which lets you select between four drive modes. The new A6 is a much better looking car than its predecessor thanks to some in depth revisions to the front and rear. If you are an Audi enthusiast you will recognise these changes having seen them on everything that Audi has come up with in the last 12 months. From the Q5 to the Q7 and the new A8, A7 and even the RS5, they all sport the same set of external lines and embellishments though in varying sizes and slightly different geometrics to cater to their segment. So things such as the new grille which is bolder and more dynamic, angular and sharply defined headlamps with the kinked LED cluster, and even the sculpted hood may all seem familiar. Yet subtle changes even amongst these details such as the trapezoidal lamps or the blanked off air vents on the bumper make the A6 look attractive, smarter and fresher than anything else in the segment. On the subject of lights the full LED headlamps as seen here are optional equipment and a fairly expensive option too. In standard trim you get the daytime LED's with xenon plus headlamps, which are an attractive and effective set without taking anything away from its good looks. At the rear the tail lamps appear similar to the older generation car but take a closer look and you will notice how they've gotten sharper, clearer and now deploy LED's in a more dazzling array. There are over 50 LED's performing various tasks in those tail lamps, not counting the ones that go into the front head lamps and the turn indicators all over the car. The lights work marvelously and unlike conventional LED's you don't see the light pin points but rather due to a technology called light scattering you see a continuous band. The turn indicators are thin narrow strips comprising of some 56 LED's in total and the effect they create especially when you switch on the hazards and see two slivers of light blinking is stunning. The interiors of the A6 however are even more inviting than the exteriors. This is luxury and comfort at its very best integrating all the nicest elements we've recently seen in the A8 and the A7 while doing away with some of the slightly dated elements from the older car. The dashboard is thinner though it still is just as deep. The anorexic look however gives a feeling of more space especially around the footwell. Like in the A8 or the A7, the central stack on the dashboard with all its controls tilts subtly towards the driver which enhances the sportiness of the interiors. The clocks on the cluster are one of the nicer bits in this car and the sharply delineated face which almost feels 3D like is clear to read yet sporty to look at. I especially loved the way the needles do a full spin around the meters and come back to zero when you crank the engine. The thin dashboard also means you don't get a centre screen integrated into the dashboard but rather a slide out unit like in the A8. It also has the touch keypad to flip through radio channels or you can scribble telephone numbers on it though only lefties will be able to do this easily. The seats are sumptuous, there is enough under thigh and side bolstering and though I did feel they were a bit hard they are extremely supple and supportive if you spend more than an hour in them. Don't take my word for it though, go and try it out yourself and I think you'd be pleased with the results. Yet what sets the A6 apart from anything else you've seen and experienced so far is the quality of the materials and the fit and finish. The interiors of the new A6 makes cars like the E-Class and even the 5 Series feel dated. The leather, wood and even polished aluminum accents feel rich and expensive and elevate the lushness of this cabin. Even the manner in which the buttons are placed or the tactility and soft touch feel of the controls leaves you with a sense that this cabin is extremely good value for money which you somehow don't seem to feel in the competition. At the heart of the new A6 is its adaptive air suspension but what the current generation car adds to it is the Drive Select feature which allows the driver to choose between four drive modes. Yet another significant addition is the use of a composite steel aluminum structure for the body which is 15 percent lighter than a conventional steel body. High end steel makes up a large portion of the body but unlike any other car in the segment it is the use of aluminum (nearly 20 percent of the body is aluminum) that makes the A6 unique. Body panels such as the hood, roof, doors, the support frame behind the instrument panel and the boot lid are all aluminum. The suspension too uses aluminum extensively, the engine cross strut and the cross members behind the front and rear suspension, the suspension strut towers, the control arms and several other components are made from the lightweight yet structurally strong metal. This contributes to reducing overall weight of the new A6 by nearly 80 kilos compared to its predecessor making it easier for the adaptive suspension to cope with the diversity of Indian road conditions without stressing itself out. Now the adaptive suspension is also unique because it's the first time it's being applied in this segment with Audi's Drive Select program. This electronic mumbo jumbo truly works wonders for the A6, firstly because the suspension does not need any more tuning, and secondly it always ensures ride height is optimised so that nothing scrapes the under chassis area. Even in cases where you may require a bit more clearance like when trying to drive across a speed breaker or an especially nasty stretch of road you can raise the ride height by 20mm though once back at speed (120kmph) the car will lower itself automatically. The Drive Select modes can be selected on the MMI and these vary from Comfort to Dynamic with an Auto mode modifying the A6's performance to correspond to the inputs made by the driver. So drive sedately and the transmission shifts into higher gears quicker to offer a silkier engine feel for instance, or get aggressive on the throttle and the engine map makes everything feel a lot more dynamic. For the more discerning driver an Individual mode allows each and every parameter to be tuned uniquely without automatically altering the character of another. So you could choose to make the engine more spirited yet retain the light steering while at the same time allow the suspension to stay in auto mode choosing how it wants to behave on its own. The A6 also has a very sporty stance, its 4915mm wheelbase is ideally supported by its 2086mm width with a wide but dissimilar front and rear track (1627 / 1618mm) respectively. Dimensionally both the front track and wheelbase has increased by 5 mm and 69mm respectively compared to the older car though overall length has reduced by 12mm. At the front the suspension comprises of a 5-link setup, with double upper and lower wishbones, an anti roll bar and continuous damping control shock absorbers. Aluminum is the principle material used in the control arms, wheel carriers and pivot bearings. The front subframe that supports the engine and the front axle however is made of high strength steel to ensure longitudinal and lateral forces are absorbed adequately. The rear wheels are mounted between a self tracking trapezoidal-link axle with standard wishbones that are primarily tuned to provide optimal balance between ride comfort and stable dynamics. Aluminum in various forms is once again generously utilized in various components especially the two hollow trapezoidal links and the wheel mountings. the smallest wheel size in the A6 range - at each corner complete the suspension and chassis package. Playing with the various electronic driving modes very clearly brings up the differences in the way the car rides and performs. You instantly get a sense of how the air suspension or the steering stiffens up or lightens or how the engine becomes more enthusiastic or mellow depending on the mode you chose. Most of the time you will find the comfort setting more than adequate for almost all driving conditions, even if you want to dial up the cars enthusiasm a notch. On the flip side however the electromechanical steering lacks the natural feel of a more conservative hydraulically assisted steering with a variable steering ratio. The new A6 steering does not feel as progressive neither does it offer the level of feedback you'd like. Ride quality though is impressive and even over some immensely undulating surfaces with rough, broken tarmac patches thrown in the A6 never felt ill-equipped. It is a bit stiff and over certain patches does feel bouncy and hard but as you will read up ahead in the comparison that ride quality is still much better than that of the BMW and on par with the Merc. Damping from this advanced air suspension works brilliantly and rapidly and you never get uncomfortable inside the cabin though you do know exactly everything that the tyres roll over. But what distinguishes the A6 is its handling which even when pushed hard seems to scoff at the novice driver in a 'is that all you can do' kind of retort. The all-wheel drive system gives the A6 an incredible amount of dynamic flexibility though when it all comes down to the steering the slightly desensitized feel of the electromechanical unit brushes off some of the overall brilliance of this package. Yet the A6 somehow does not feel as fluid as the A7, both of which share the same platform. Where the A7 feels more connected and immense fun, the A6 is a bit tauter, more rigid and not as involving. In fact to get the best from this car, set the engine in dynamic mode, while leaving the suspension and steering in comfort mode to vastly improve the driving experience. The A6 will have a choice of four engines, two petrol and two diesels, though the engine most desired could either be the 3.0-litre turbocharged V6 diesel on test here or the supercharged V6 TFSI petrol. The 2967cc diesel is a slightly more powerful and efficient engine than its predecessor thanks to several thermodynamic and weight saving measures for example the vermicular graphite cast iron crankcase or the lighter rotating elements which improves engine responses. Power has increased by around 5PS to 245PS between 4000-4500rpm compared to before. Max torque is a huge 500Nm available between 1400-3250rpm which is useful when you want instant acceleration, whether from standstill or while rolling along. This engine was revised from the ground up and the principle focus was on making it lighter than before and it has resulted in a loss of 25 kilos bringing the weight of the engine down to just 193kilos. For a V6 that is an amazing saving, the benefits of which are reaped through better efficiency, lesser vibrations and noise, much more refinement, quicker responses and therefore better performance. CO2 emission are now brought down to just 158g/km and that makes it around 16 percent better than the older 3.0-litre diesel. This engine also comes strapped with a standard 7-speed S-Tronic transmission, Audi's dual clutch system derived from the VW Group DSG. The shift speed in the A6 can be adjusted to adapt to whatever the driving condition demands, so if dynamic mode is selected it alters the shift points allowing the A6 to hold on to a gear for a little longer and come closer to the redline before upshifting. However given more sedate highway cruising the A6 shifts quickly into higher gears allowing the driver to experience a more relaxed unstressed feel from the engine. As for the rest of the engines, the 3.0-litre TFSI makes over 300PS of max power and is the hottest engine in the range. But the 2.8-litre TFSI and, better still, the 2.0-litre diesel could see even more favor in these times of high fuel prices especially since both these engine are mated to lighter and less complex front wheel drive. The petrol engines also get the start stop system which switches off the engine when the car is brought to a halt and stays inactive for more than a few seconds. However all A6's benefit from brake energy recuperation system that stores energy braking energy and uses it to charge the battery thus reducing the alternator sapping power from the engine. The 3.0-litre diesel is immensely quick, acceleration to 100kmph is achieved in just 6.1 seconds, while the quarter mile takes 14.2 seconds. Even more impressive is the in-gear acceleration, the A6 moving though the gears from 40kmph to the ton in just 5.2 seconds. Throttle responses on this car are impressive, no doubt brought about by the intercooled variable geometry turbo, an optimized intake and exhaust system and a superior direct injection system employing the latest 8-nozzle piezo injectors running at 1800 bar pressures. This executive sedan is quick without making it feel urgent and rushed. The engine responses are linear and smooth while the transmission shifts are quick and progressive. There are also generous reserves of torque to ensure smooth overtaking maneuvers at high speeds. 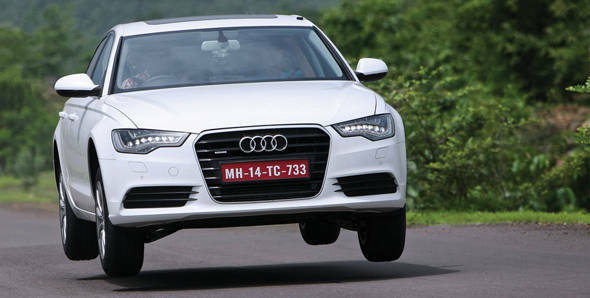 Where fuel efficiency is concerned the new diesel A6 covers 14.8kmpl on the highway and gives 8.4kmpl in the city. That leads to an overall efficiency of exactly 10kmpl no doubt brought into effect by all those weight saving measures and optimized transmission. That's a fairly healthy figure considering something like my long term Yeti also manages to provide an overall efficiency of just around 10.5kmpl. The A6 is equipped to the gills and in a straight head to head comparison, it has all the bases covered while any other would be lagging far behind. It has nearly the same amounts of equipment level as the flagship A8, except for the night vision and HUD assistance systems. Its got a plethora of driver assistance systems such as ESP, ABS and a pre sense safety system which detects when a crash is imminent and alerts various systems within to take safety measures making the A6's safety net quite vast. It also offers an advanced parking assistance system along with a state of the art multimedia player that connects to external devices via Bluetooth or through SD cards. However the video screens for the rear passengers isn't standard fitment and the option is a very expensive one. On the comfort and convenience side you get keyless entry and ignition, seat warmers, four zone climate control, a 14 speaker Bose surround sound system and AUX connectivity along with an Apple device docking port. The cables to dock it however are exorbitantly priced and interestingly iPhone4s did not seem to be compatible with the system. One must must opt for the LED headlamps and the 14 speaker BOSE surround audio system for an unforgettable visual and aural impact. Yet even without these the A6 is going to be just as sensational. Its anyway got a tremendous amount of kit as standard and we expect the price to be very competitive. For those looking for a drivers experience the A6 is rewarding, both on the performance and efficiency front. My defining aspect of the A6 has to be the interiors which sets a new standard for the class. The interiors are what will sell this car - it really is remarkable just how much better the A6's cabin is compared to the rivals. Equally impressive is the step forward in dynamic ability. It now rides nearly as well as the E-Class at low speeds around town but when the going gets rough the adaptive air suspension responds faster to surface undulations, crests and dips to keep the body planted and stable, consequently being able to carry more speed and have much more fun. There is no doubt the new A6 has taken the game to another level, it's a richer experience and one that will have most owners cooing with delight. And once word passes around it should also be a strong magnet to attract brand loyalists away from the three-pointed star or BMW. What makes the new A6 particularly inviting is the amount of technology it packs in, in every facet of the car. Its a tremendous ego booster, a one upmanship card to play at cocktail evenings. We expect the A6 to be priced competitively, somewhere between the Rs 47-50 lakh bracket which should ensure wide appeal and hopefully more conversions for Audi. So minor celebrities, TV stars and second rung IPL cricketers who are just getting the big paychecks are going to love the bling this car offers. So on the one hand Audi India finally has the product portfolio to take on the more established brands in the segment. With the A6 which will address a wider audience than say the A8 and the A7, the numbers should finally see an upward trend. For me just the one additional day away from home then was well worth the drive. A longer relationship with their clientele then should certainly see the A6 brave stormy weather and finally ensure safe passage for Audi India to a land of plenty.